Pineapples are generally found in the tropical region and have a sweet and sour taste. Biologically, the pineapple, as it appears as a golden orange egg-shaped spiked mass with a tuft of green leaves on the top, is not a single fruit but a collection of multiple blossoms in an inflorescence. Pineapples are an optimum source of nutrition as they are very low on fat content and are very rich in phyto-nutrient vitamins such as B1, B2, B3, B5, B6 and C and minerals as manganese, copper, potassium, beta carotene, folic acid and fiber. It is actively used in home remedies and traditional medicine. Pineapples also have an enzyme called bromelain that has anti-inflammatory properties and helps to provide relief with many ailments. Whole pineapples can be cut into slices and eaten, or mixed in a fruit salad or dessert. Pineapples are also used in chicken and pizza preparations, or simply eaten roasted and glazed with honey or yoghurt. When processed to extract the juice, it helps to deliver the nutritional ingredients faster to the body but loses out on the fibrous benefit of the fruit. Beta carotene and vitamin A are important nutrients for healthy development of eyes. In its absence, people might experience gradual loss of vision and have difficulty in reading and recognizing objects properly. If consumed regularly, pineapple juice is proven by research to reduce the risk of macular degeneration in old age. The presence of antioxidants also helps to solve eye related problems and maintain good health. Even though magnesium is required in only trace amounts in our body, there are not a lot of food groups included in our everyday diet that are rich in magnesium. Magnesium is a crucial part of the DNA construct and is needed for strengthening our bones and connective tissues. Pineapple is a rich source of magnesium. A cup of pineapple juice complements at least 73% of our regular requirement for magnesium. During development in a child, pineapples aid growth of bones while in old age, it helps to strengthen them. Pineapples benefit all parts of the digestive system. In the mouth, it helps to keep our gums and teeth healthy and strong. It prevents formation of plaque and restricts bacterial activity in the mouth, reducing the risk of periodontal disease and gingivitis. 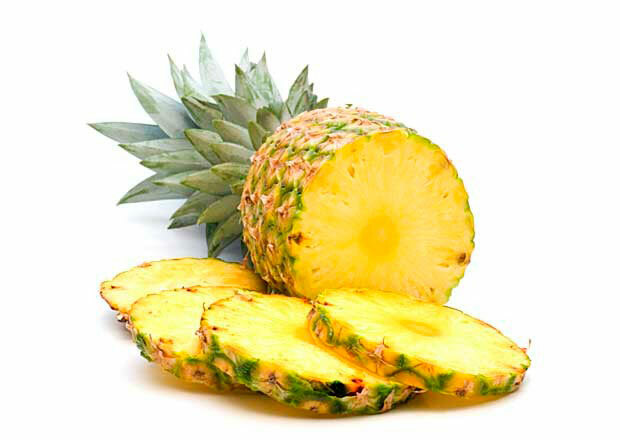 Bromelain is an excellent proteinase that helps to effectively break down proteins in our food. Vitamin C and dietary fibre, which is abundantly present in pineapples, helps to increase our metabolism and digest our food better. It also helps to promote good bowel movements and get rid of certain intestinal parasites such as tapeworms. 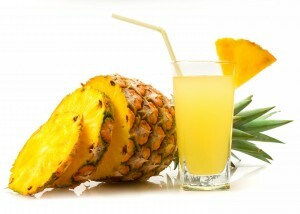 A cup of pineapple juice is also found to be effective in fighting nausea or motion sickness. Pineapples are good for the health of hair in that it helps to prevent hair loss and thicken hair stands. 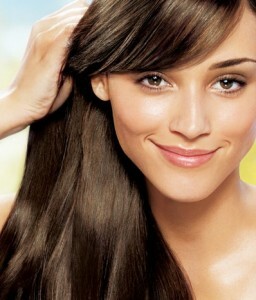 Vitamin C, which is abundantly present in pineapples, helps to prevent hair loss. Its antioxidant properties are good for combating free radicals which damage hair growth. Whether consumed as a whole fruit or made into juice, vitamin C is a water soluble vitamin that not only helps in to fight hair loss, but also provides nourishment to the hair follicles. Pineapple extracts are also known to be rich in enzymes that help provide vital nutrients to the follicles as well. This improves their elasticity and thickness and makes them sturdier and more resistant to breaking. The bromelain in pineapples also combats inflammation of the scalp and prevents scalp infections that might cause unwanted hair loss. Pineapples not only cater to the health of hairs but also nails. Rich in vitamins, it is an effective way to fight vitamin deficiency symptoms such as cracked and brittle nails. You can either eat the pineapple wedges or apply them directly on the nails to get soften and strengthen them. The antioxidants present in pineapple juice helps to fight against free radical damage in the body. This not only prevents cell damage, but also prevents formation of cancerous tumours and protects from other diseases such as atherosclerosis, arthritis, heart diseases etc. The vitamin C also helps in strengthening bones. Vitamin C also helps to boost the body’s immune system, especially because of its antioxidant function. Doctors are known to recommend regular consumption of pineapples to patients with arthritis and other diseases that cause swelling of bones and tissues, because of its anti-inflammatory properties. The vitamin and mineral content also helps to strengthen bones. In patients suffering from acute bronchitis, the anti-inflammatory properties of pineapple help to reduce the inflammation in bronchial tubes. Pineapples are also recommended in cases of catarrh, where the mucous membranes in cavities or airways become inflamed. 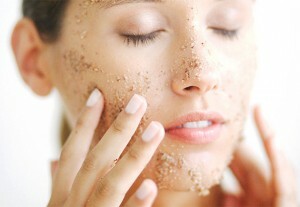 Freshly crushed pineapple make excellent exfoliating agents for the skin. That, along with its collagen regenerating properties, helps to slough off the dead skin cells and increase blood flow to the skin, making it look healthy and radiant. They are especially good for healing cracked feet. Not only does that eliminate the dead calloused skin and leave them feeling smooth, but they also relieve the painful inflammation and swelling caused by cracked feet. When used along with coconut oil, pineapple hydrates chapped lips and soften them, besides giving them a healthy glow. The powerful antioxidant properties of pineapple lower levels of free radicals and cholesterol, preventing occurrence of heart diseases. The mineral content in pineapples, which is high in potassium and low in sodium is the best way to cure hypertension and maintain normal blood pressure levels. A cup of pineapple juice is known to contain 1 mg of sodium and 195 mg of potassium. Bromelain in pineapples reduces the viscosity of blood and is known to improve blood circulation and ensure smooth flow of blood in the vessels. Vitamin C also prevents atherosclerosis. The vitamin C present in pineapples makes it an excellent cure for acnes. Whether used topically or consumed, it works effectively in addressing acne and other inflammatory problems of the skin. The enzyme bromelain boosts the healing effect of vitamin C. Besides being an effective solution for acne, pineapples also have collagen synthesizing properties which help to fight ageing processes and makes the skin smooth and firm. 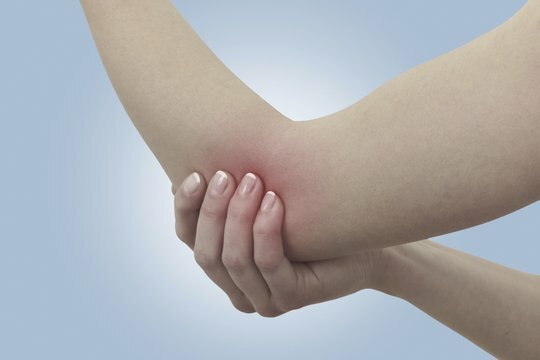 Vitamin C and amino acids provide nourishment to the damaged tissue and cells, boosting their repair process. One way to incorporate pineapples in your beauty treatment is to apply fresh pineapple juice to the face and leave it on for some time. After 10-15 mins you can wash it off using lukewarm water. Another way would be to make a hydrating pack by mixing freshly crushed pineapples with an egg yolk and some milk and applying it on the dry. After few minutes, you can wash it off with warm water. The alpha hydroxyl acid in pineapples will give you a hydrated and radiant skin. The abundance of vitamin C and bromelain helps the body to fight against microbial infections. Along with prescribed antibiotics, eating pineapples helps to cure cough and cold. Bromelain also helps to break down fibrin and resolve clotting within blood vessels. Bromelain also helps prevent many other ailments such as sinusitis, eczema, psoriasis, dermatitis, rosacea, sore throat, gout and swellings. Pineapple juice is a natural diuretic that helps to release toxins from the body. 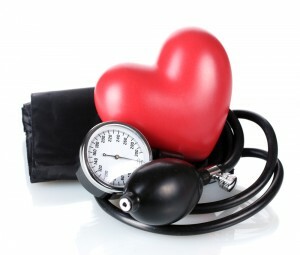 In spite of its many benefits, it may also cause some side effects. Some people are allergic to pineapples and develop rashes and swelling around their lips on consuming one. Excessive consumption of pineapples may also cause diarrhea and menstrual bleeding. There has been evidence in literature of Malaysians and other natives using pineapples and parts of the plants as abortificient, either by avoiding pregnancy or invoking miscarriage. Therefore, pregnant women are advised to seek doctor’s counsel before including this fruit in their diet. Avid reader who loves to write as well. an online business entity that I heard about and I have earned such great cash.